A mentor of mine once told me that I needed a unique Wealth Plan Process or capability to set myself apart from the pack. I took him at his word. We developed over time a unique process in the wealth transfer area which allows us to explore, project and review the benefits of a good wealth transfer plan – The Wealth Plan. First of all, we wanted to develop a process that was both good with analytics and easily communicated. If it is too complicated, no one will use it, or take the time to understand it. My engineering and financial background made me a stickler of modeling various strategies accurately. Over time, I have learned that most people don’t want to go through all of the analytics (unless they are analytical like myself), but they want me to be able to go through the analytics with their technical people. So the analytics are extremely important. Next, having the capability to model various strategies which could be used in tandem with other strategies can multiply the impact (particularly over time) of those individual strategies. For example, being able to transfer a discounted asset, without losing control of that asset, and allowing the appreciation to continue outside your taxable estate might mean millions of dollars of tax savings. 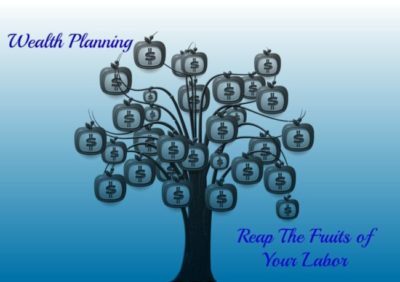 Our wealth plan process had stood the test of time over the last fifteen years that we have been using it. We have a number of our clients who have been able to reduce their estate and gift taxes to zero, or have substantially reduced the amount required. In addition, many of our clients who thought they would have to lose control of their assets in order to get the benefits of wealth transfer planning have found that there are means to maintain control, yet get the benefits of a reduction in taxes.